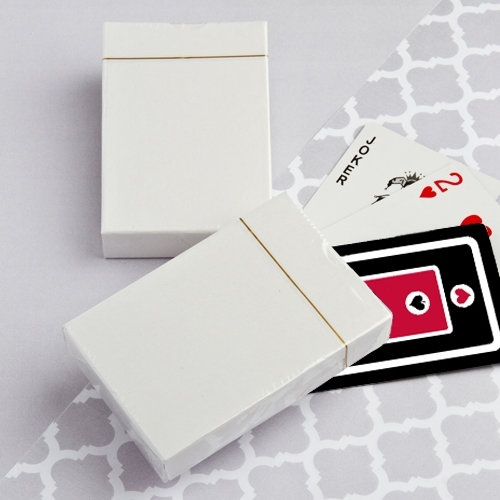 Dimensions: 3 1/2" x 2 1/4" x 3/4"
This deck of playing cards from Fashioncraft's Perfectly Plain Collection will help give you a winning hand! Each full-sized deck of playing cards features an eye-catching black, white and red design that features the full array of suits: clubs, diamonds, spades and hearts. Decks come bulk-packed in white boxes wrapped in clear plastic. "I received your party favors package today, and was so excited I opened them immediately. They're beautiful and something all of us can enjoy!" Allison Q.